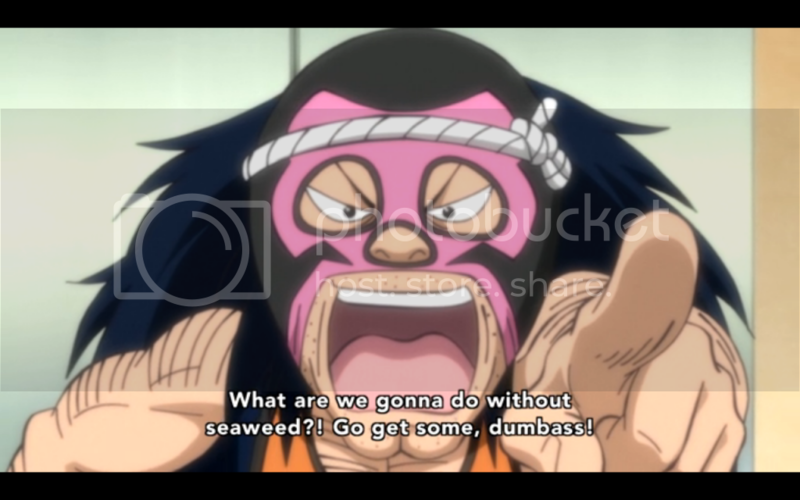 Toriko and Komatsu go to get some special seaweed, called eco nori, a kind of seaweed found only in one special place. They travel to the lands of Aimaru and his Gourmet Knights, who then take them to Eco Village, where the seaweed turns out to be the out layer of a certain kind of tortoise. After Toriko charges all the solar batteries for the tortoises, they return to Monchi with the seaweed. He then creatures the fortune roll, by wrestling the ingredients into submission. 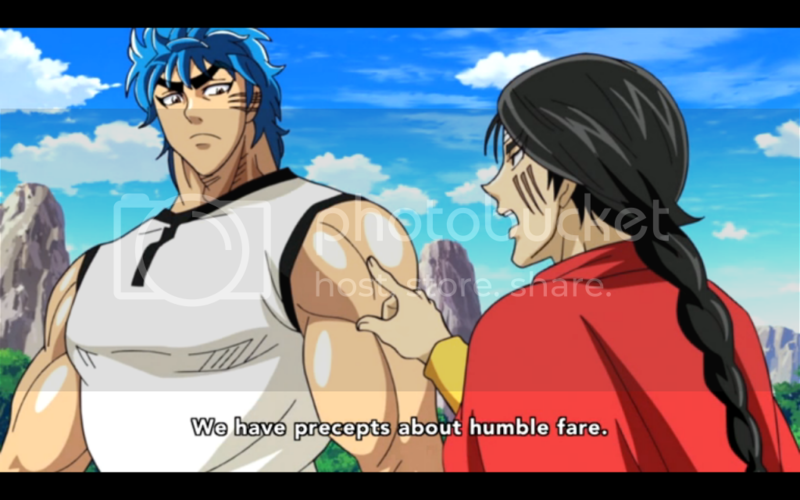 Toriko is one of those series where if you take a couple of week’s off like I did you come back wondering what the heck you’re watching. Thus it was for me, after a few weeks of not watching the anime, and reading the more series current storyline of the manga. Coming back to what is essentially a filler, yet not really since it was in the manga, is very odd. I find myself asking, “Did I really just see that?” more and more often. My expression throughout most of this episode. This episode dragged on a lot longer than I thought it should have. Perhaps it’s because there was not enough material left before the actual plot needs to move on, otherwise I imagine they would have made this another double story. The parts with the eco village were interesting, if some of the more ludicrous stuff I’ve gotten from the series. 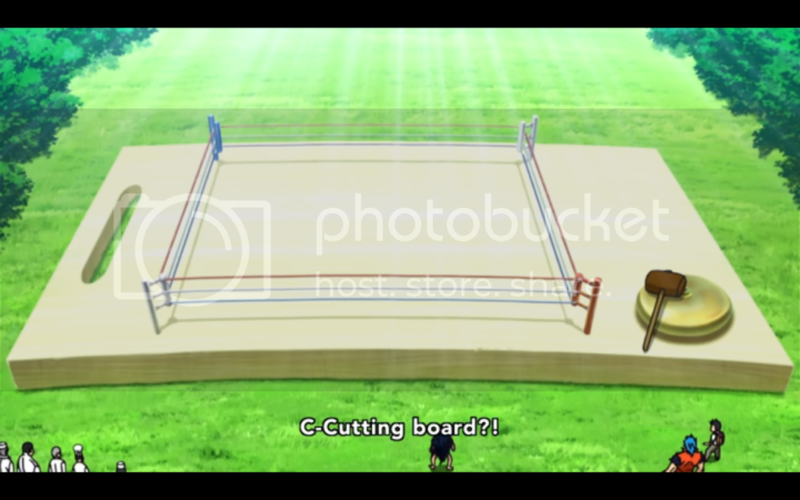 I found, however, that this series’ weakest point is the tropes that can be found in far too much anime. For example, Monchi and his brother are beyond irritating. The voices are bad enough, but the fact that their entire personality is based on a single phrase or word is frustrating as heck. I find this kind of thing works best in the manga, but when put into motion and voiced these character quirks get real old real fast. And the fact that the anime always spends more time focusing on them gets to me. Ultimately I found this episode suffered most from my having been away from the series for so long. I found myself getting annoyed much faster at smaller things that I ignored up to this point. Toriko and Komatsu’s vocalizations of wonder, also known as the “Ooooooooh!” get real annoying the further you get into the series. I think this is a weakness of anime in general, especially series produced by Toei. They just spend far too much time focusing on the most basic of tropes and characteristics. Which is a complaint I’ve heard from many friends that don’t care for anime. I can’t argue against that, because I find myself agreeing with it more and more. Of course that has more to do with the types of shows that I watch, so expanding my horizons might not be a bad idea. I may need to get away from all this shonen, or at least watch more other shows on top of that. The comforting sense of familiarity is starting to wear thin where shonen series are concerned. One could say I’ve left the honeymoon stage and am now starting to notice some of the more irritating habits.